TWO Saturdays ago I made a stand at the ballot box to support the political ideals I believe in. Now I’m going to buy a ticket to see Ghostbusters, and because it’s 2016 and everything is weird these days, that’s kind of the same thing. 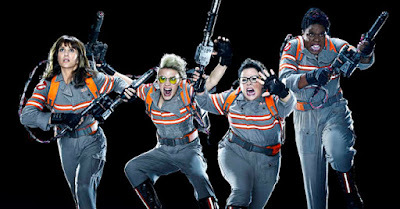 Because thanks to the incessant trolling of this otherwise innocuous film by hordes of men, sweating into their keyboards while Cheeto dust gathers in piles on their laps, going to see the new all-female Ghostbusters has somehow become a political statement. When the trailer was released on YouTube in March it became the site’s most “disliked” movie preview, immediately racking up more than 600,000 thumbs-down votes. The film tanked in the ratings on movie database IMDB after users spammed the listing with low ratings – again, before it had even been released. Now that it’s in cinemas and getting critical praise (it’s currently rated at 74 per cent “fresh” on film reviews website Rotten Tomatoes), the trolls are back at it. On popular online discussion forum Reddit there are whole threads of men discussing how to downplay the positive reviews the movie is getting, and how they can convince people they’re wrong. One critic who gave the film a positive review wrote how he had since been attacked online by men claiming he must have been paid off by the production company, or that he didn’t really like the film but was just being “politically correct” and “pandering to feminists”. This must be the first time in history a film critic has been attacked by fans for LIKING a film. With a reaction like this you’d be forgiven for thinking Ghostbusters is the worst film of 2016, or perhaps all time. But it’s not even the worst Ghostbusters film; doesn’t anyone remember Ghostbusters II? The major villain of the piece was a painting, for goodness’ sake. Of course the backlash against the film has nothing to do with whether it’s objectively bad. That’s obvious, given the tsunami of hatred started well before anyone had even seen it. No, the complaints have an irritatingly familiar ring to them. We saw the same nonsense when it was announced the hero of the new Star Wars film would actually be a heroine. We saw it when it was announced Sandra Bullock would lead an all-female remake of Ocean’s 11. We saw it when Peter Jackson invented a female elf warrior for his movie version of The Hobbit, because not to do so would have resulted in a film with no active women in it at all. One lady elf shoots a few arrows in a sausage sizzle of a film that’s more than five hours long, and dudes start ranting about the “feminist agenda”. Here’s the thing: I don’t even really want to see the new Ghostbusters. I’m not sure it’s the kind of film I want to spend $23.50 to see. But I feel I have to. If it’s a flop at the box office, perhaps the message in Hollywood will be “female-led films don’t sell”, and we’ll never get another one. Of course when a male-led blockbuster tanks, no one blames the gender balance. The Lone Ranger was one of the biggest box office flops of all time, but you didn’t hear anyone complain it was because there were too many men in it. A recent study found that just 12 per cent of protagonists in major films are female, compared to 75 per cent male, and that male characters do 70 per cent of the talking in films compared to females at 30 per cent. A feminist takeover of Hollywood? I can only hope it comes soon. First published in The Advertiser, July 17 2016. CLICK HERE to read the original article.